As of the end of 2016, the South Coastal Library collection includes 51,869 items and has a circulation of 175,252. Registered borrowers number 14,363 with 125,866 patron visits, including those of residents and visitors to the area. In 1978, a library was established on Garfield Parkway in Bethany Beach. This replaced a busy bookmobile stop. The library was a joint venture sponsored by the Delaware Division of Libraries. The Division provided a building (480 square feet trailer) and the original book stock, the town of Bethany Beach provided land, and the County provided the staff and all operating expenses. The county has continued to operate and maintain library services for the Bethany Beach area. It was not long before the library outgrew its space. In 1994, the library opened in its new and spacious quarters (10,000 square feet) on Kent Avenue. Again, this was a joint venture. 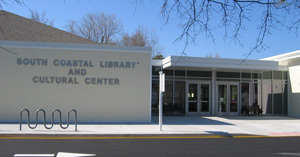 The Friends of the South Coastal Library supervised the design and construction and did all of the fundraising, the town of Bethany Beach provided land, the State of Delaware provided 40% of the construction costs, and the County provided $50,000 toward the construction and all operational responsibilities. On April, 20, 2009, the newly expanded and renovated library reopened at the Kent Avenue location. The building is now about 22,000 square feet and includes a larger Meeting Room, Children’s Area, Teen Central, and adult collection areas. This, too, was a joint project funded by the state of Delaware, Sussex County, and the Friends of the South Coastal Library. The library is currently funded for a staff of fifteen (15), including a Library Director, Assistant Director/Reference Librarian, a Youth Services Coordinator, a Circulation Supervisor/Volunteer Services Coordinator, Library Assistants, and a custodian. A corps of talented volunteers supports the staff. Friends of the South Coastal library serve as a support group through advocacy and financial support for additional programming and materials beyond the scope of the operating budget. Individual members of the Friends also serve as volunteers.